NEW! Peaceful Farm House w/Hot Tub - Mins to OSU! At this 2-bed, 1-bath vacation rental home, the stars are brighter and the sunsets are more magnificent. Escape from the city to this house boasting modern conveniences with rustic features. Six can soak in the hot tub or relax on the wooden deck! Enjoy the tranquility of the property's peaceful 60-acre Glencoe setting as well as proximity to Stillwater and OSU 12 miles away. This contemporary barn-style home is the ideal spot to rejuvenate from the real world by relaxing in the quiet countryside. Enjoy being surrounded by 60 acres of wide open green grass, a nearby pond, and the simple beauty of nature. If you're traveling with kids, they'll love playing on the tall swing-set! After attending an OSU sports game or event, come home to your vacation rental to recharge. Unwind on the wooden deck and crack open a cold one in the 6-person hot tub! Use the gas grill to throw a home-style BBQ and sit down to feast at the lovely patio table. When the sun goes down, you're in the perfect place for stargazing! Get cozy in 2 queen beds to restore your energy for the next day. Two extra travelers can snuggle up on the sleeper sofa in the living room and catch a favorite show on the flat-screen satellite TV. In the morning, prepare a delicious brunch to kick-start the day. The fully equipped kitchen provides everything you need for an unforgettable family meal, like a stainless steel fridge, gorgeous wood cabinets, and plenty of dishware. After breakfast, go for a walk with a cup of coffee in hand to take in more of this amazing property! 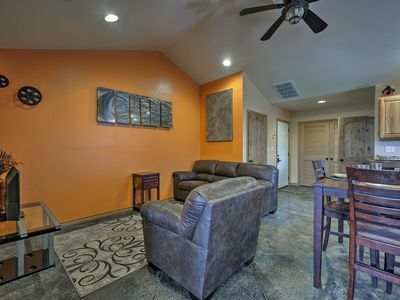 This vacation rental home sits on 60 acres in a rural area of Glencoe, Oklahoma. The city of Stillwater, home to Oklahoma State University, is a 20-minute drive from the property. Drive 12 miles to watch the Oklahoma State Cowboys play football or basketball. This house is also a great home base if you're in town for a family member's graduation! Other Stillwater activities include the Lost Creek Safari if you feel like visiting a zoo, Boomer Lake Park for scenic walking trails, and the Botanic Garden. You can also find a wide variety of delicious restaurants and shops in the charming downtown area! Check out a local favorite, Iron Monk Brewery.